Protect your indoor air quality with expert acoustic ceiling removal in Encino CA. Do you hate the look of lumpy, bumpy textured ceilings or crumbly old ceiling panels? You are right to despise these materials. If these materials date to the 1970s or earlier, it’s possible they may contain asbestos. 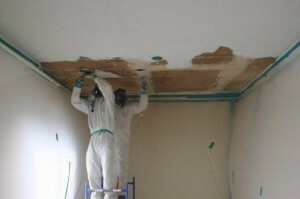 Fortunately, you can eliminate the risks associated with asbestos ceilings with expert acoustic ceiling removal in Encino CA from AQHI Inc.
Acoustic ceiling removal in Encino CA helps reduce contamination by removing the potential source of any asbestos fibers. However, you must choose a quality contractor for this to be true. A DIY job or work done by an inexperienced contractor can actually spread contamination from the room with the asbestos ceiling to other parts of your property. As a licensed and certified contractor, you can rely on AQHI Inc. to put safety first every step of the way when you hire us as your acoustic ceiling removal in Encino CA. If you want to confirm we offer great service we can refer you to a long list of satisfied clients. Our asbestos removal office for Acoustic Ceiling Removal in Encino CA is open Monday through Friday between 8:00 AM and 5:00 PM and closed for lunch from noon to 1:00 PM. With advance notice, projects can be scheduled for weekends, early mornings and evenings.